Here are some key insights you may gain from tracking your intake, plus how each one can affect your ability to slim down. If you tried to recall everything you ate and drank yesterday, chances are youâd forget a thing or two (or five), and thatâs completely normal. Unless you consciously set out to think through everything you put in your mouth, itâs easy to forget about a free sample at the market, a few nibbles while cooking, or a taste from your partnerâs plate. Trouble is, those unacknowledged extras can add up quick, and get in the way of weight loss and health results. Whatâs more, you may be engaging in unhealthy patterns youâre not even remotely aware of. The solution: start keeping a diary. 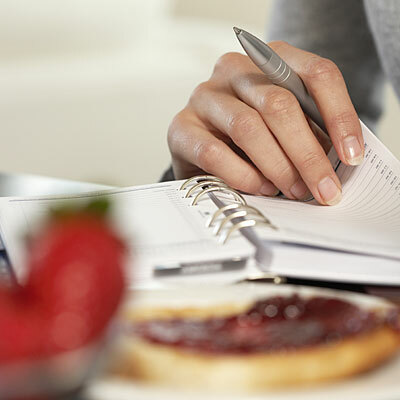 A Kaiser Permanente study involving more than 1,600 people found that those who kept a daily food journal lost twice as much weight over six months (18 pounds versus 9) compared to those who werenât regular recorders. Another recent study, published in the Journal of the Academy of Nutrition and Dietetics, found that overweight and obese women in diet only or diet plus exercise weight loss groups all lost weight. But those who kept food journals shed six extra pounds. I ask my clients to record not just what and how much they eat, but also how they feel emotionally at mealtimes, as well as their hunger and fullness ratings before and after eating. Many realize theyâre triggered to eat not by physical hunger, but because theyâre bored, sad, angry, or worried. Others notice that they eat to pass time when procrastinating, or out of habit, such as always having a snack while watching TV. This kind of insight is invaluable, because triggers and patterns are often unconscious, and you canât change something you donât even realize youâre doing. Keeping a journal changes that, because it allows you to identify the âwhysâ of your choices, systematically work on forming new habits, and find non-food ways to cope with emotions (for more, please see my previous post 5 Ways to Shut Down Emotional Eating). After starting a diary, one of my clients was shocked to learn just how much more she ate with her hubby compared to dining solo or with friends. Not only were the two âpartners in crimeâ who enjoyed indulging in things like ice cream together, but they often split pizzas and ate similar portions, even though his needs were far greater than hers. It took making this connection for her to realize that gaining 15 pounds since they moved in together wasnât just about getting older, and she felt empowered to make changes that led to weight loss. If you're in the same boat, check out my previous postÂ Is Your Partner Making You Fat? In a fascinating study, Cornell University researchers used a hidden camera to spy on patrons at an Italian restaurant. Just five minutes after the meal was over, they asked diners how much bread they had consumed. Most people ate about 30% more than they thought, and 12% of people who were seen eating bread on camera denied having any at all. The results aren't shocking, because eating is often mindless. When youâre chewing food and distracted at the same timeâwhether by carrying on a conversation, checking e-mail, or watching TVâitâs easy to lose track of what or how much you downed. Recording your intake forces you to pay attention and offers a real time reality check. Even texting can help. A Duke University study of obese women who participated in a six-month weight-loss intervention found that those who tracked their intake via text lost weight, while those who didnât gained pounds. Journaling often triggers major light-bulb moments among my clients about just how quickly they eat. When one began tracking, he noticed that he was always the first one to finish his food when dining with others, and even alone he wolfed down sandwiches and snacks at lightning speed. As a result, he often experienced heartburn and felt unsatisfied, even when uncomfortably full. Just slowing his pace led to eating less over a longer stretch (but enjoying food more), sipping more water, ending meals without digestive upset, and, before long, tightening his belt a notchâpretty huge payoffs for one small change. In my opinion, one of most important insights gained from food journaling is connecting what and how you eat to how your body feels. When I ask my clients to track things like energy, mood, mental clarity, and digestive happiness in their food diaries, theyâre often blown away but what the find. Recently one client realized that having a veggie-packed salad topped with quinoa, lean protein, and avocado for lunch left her feeling like a million bucks all afternoon, while heating up a frozen processed âdietâ meal left her feeling sluggish, grumpy, and unmotivated. As a result, she began bringing lunches to work, eating clean in order to feel better, and losing weight despite eating more calories (check out my previous post Why Calorie Counts Are Wrong). My clients frequently make comments like, "I eat tons of fruits and vegetables" or "I donât drink that much," but when they begin to track, they realize just how far off their perceptions are from reality. Itâs essentially human natureâwe like to recall our successes and perhaps even exaggerate them. But telling yourself nutritional white liesÂ can hold you back from reaching your goals, or even cause you to abandon them altogether. The point of a food journal isnât to judge or police yourself, or even to grade yourself; itâs to learn about yourself, which is the first step toward adopting healthy changes that stick!